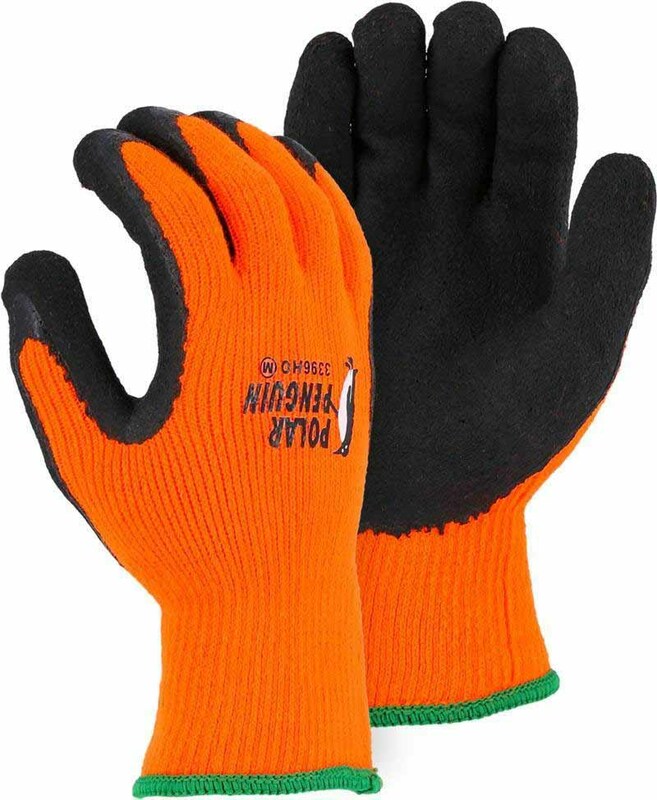 These advanced Polar Penguin work gloves from Majestic will keep your workers’ hands warm and comfortable without inhibiting movement and flexibility. They’re perfect for working in freezers and colder food storage areas, warehouses, outdoor construction sites and other challenging cold-weather environments. They’re also cut-resistant, which protects hands when handling sharp objects. 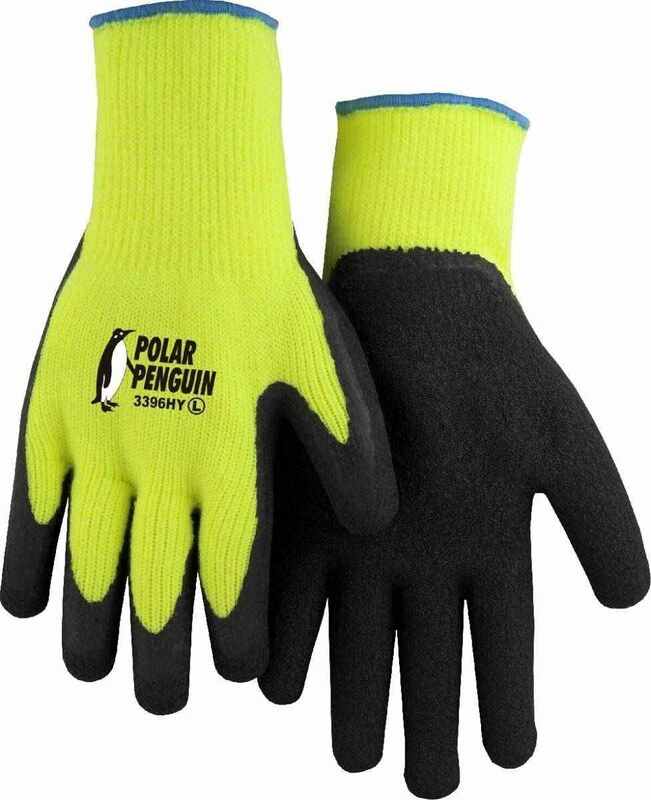 Polar Penguins 3396 gloves have a black foam latex-coated palm that ensures a superior grip and provides excellent wear resistance. The napped terry knit material helps hands stay warm during a long day outdoors or in a cold indoor environment. Pre-curved fingers maintain the hands in the optimal position for handling objects, which minimizes hand fatigue. Majestic manufactures the Polar Penguin 3396 in small, medium, large, extra-large and XXL to provide the ideal fit for every worker. 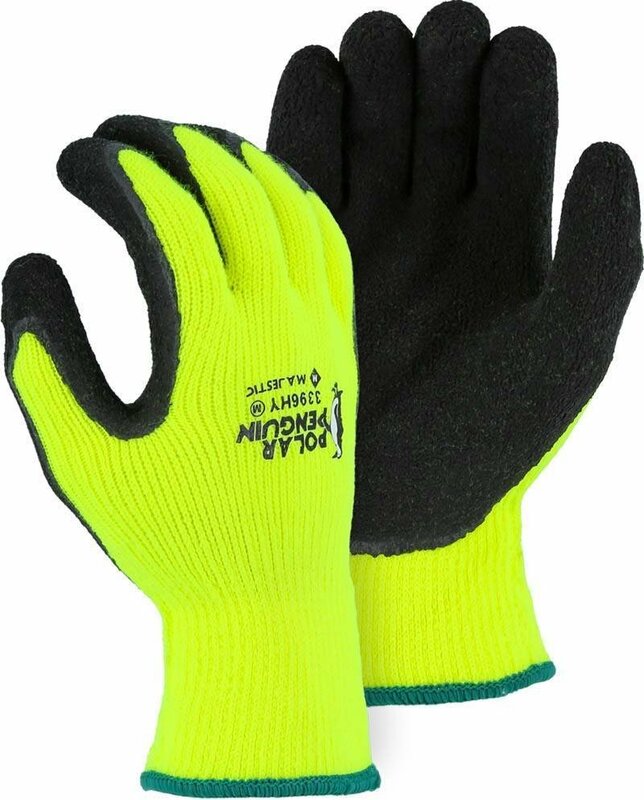 You can also choose from high-visibility yellow and high-visibility yellow – either color will contribute to a safer work environment, especially when outdoors or in high-traffic areas. PalmFlex offers the Majestic 3396 glove in packs of 12, and bulk purchasing is available to give you the benefit of volume discounts and lower unit costs. You’ll also get free shipping within the continental U.S. with all orders over $80. Our 30-day return policy ensures your satisfaction. Place your glove order online today. Feel free to contact our customer service team if you need assistance. Hi Dennis, you can put them in the dryer on low setting for a few minutes, but the recommended method of drying is to let them air dry. You can wash them in cool water on gentle cycle and then dry on low for a few minutes.